Alphacool's new Low Noise Edition of the Laing DDC for absolute silence! 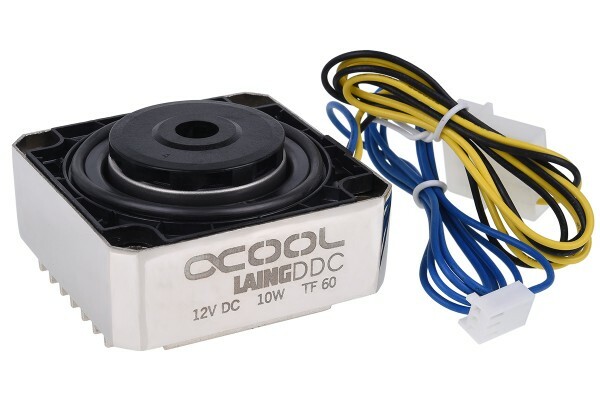 The Laing DDC pump is one of the best known pumps in the watercooling industry. Recently we have been working with Laing to take the DDC to the next level. The new Laing DDC310 was designed with a perfect balance of power and silence in mind. Unlike other versions with the plastic base we have revised the design with new superbly tuned brass housing which aids the pumps cooling and guarantees longer life especially when placed in areas with limited airflow. This new housing promises a longer life of the pump. Through the cooling fins and air flow as well as an internal thermal pad attached directly to the pump board maximum cooling is achieved. Another feature is the included decoupling option. If a pump top with a M4 threaded mounting hole, such as the Alphacool Laing DDC Acetal top is present. The special M4 screws can be screwed directly into the decoupling set and then into the case. The pump also comes as standard with an anti-vibration mounting system . Available in black nickel and silver nickel. This pump should be the first choice for your watercooling system. Not suitable for continuous operation with liquids containing titanium dioxide or glycerine. Typically, many pastel colors use these additives. 3 Vraag (vragen) in andere talen. Wie lang ist das Kabel und was für ein Stecker ist an der Pumpe? Die Pumpe hat einmal einen 3Pin Stecker, der ca.73cm lang ist und einen 4Pin Molex Stecker der ca. 52cm lang ist. Passt die Pumpe an einen Aquacomputer aqualis DDC 150 ml AGB? Bei zwei vor wenigen Tagen bei Aquatuning bestellten DDC310 mit schwarzem Schaufelrad sind das vernickelte Kühlergehäuse und die Pumpe fest miteinander verbunden, vermutlich verklebt. Bei meiner DDC310 vom November 2015 mit blauem Schaufelrad war das Trennen der Pumpe vom Gehäuse noch möglich. Auch das Wärmeleitpad würde damals seperat beilegt. Mein Frage ist nun, ob sich die Pumpe mit etwas Kraftaufwand weiterhin aus dem Gehäuse lösen lässt oder die Lieferung der aktuellen DDC310 als fest verbundene Einheit inzwischen so vorgesehen ist. Great pump and really clean looking cover. The decoupling hardware needs some work, at least when suggesting this pump to be matched with a Aquacomputer Aqualis DDC 150. I can't speak for the other suggested Aquacomputer matches, but the hex head screws are roughly 10 mm too long. If a person attempts to screw these in all the way they will break the pump top. as a work around for this problem i was gong to cut the 10mm off of the screw but luckily I had some #10 washers laying around 5 on each screw seated the pump perfectly and allowed me to mount the pump and res in my case. #10 washers should be able to be purchased at any hardware store. Other than that, the pump and pump cover are really good and would purchase again.